Does Procera AVH Work for Memory Enhancement? Does Procera AVH actually work for memory enhancement? Can a natural dietary supplement really boost brainpower, mood and focus? Procera AVH is a cognitive supplement developed by Brain Labs, Inc. in Laguna, California. This supplement is composed of three key ingredients: Acetyl L-Carnitine, Vinpocetine and Huperzine A. The ingredients in Procera AVH have been well-researched and this supplement was the subject of a randomized, 30-day double-blind, placebo-controlled trial to assess memory performance, mood and cognitive function. In this study, patients given the Procera bran supplement showed improved working memory accuracy, long term memory consolidation and better processing of information. Let’s take a look at the ingredients, efficacy, and side effects of Procera for memory before you buy it. Before looking at the effects and ingredients of the Procera AVH stack, here’s a quick neuroscience primer. It’s important to understand how memories are formed in healthy minds. In the brain, all of the information we gather from our senses is communicated via a sophisticated network of biochemical transportation. What we might think of as “data” is relayed within the brain via chemicals between neural structures called neurons. These neurons then emit electrical impulses which trigger various responses in the brain and body. The pathways between neurons are called synapses. If neurons and synapses are healthy, these pathways become more stable and semi-permanent over time. In the hippocampus, these processes work to encode information, store it, and retrieve it when it is needed again. The key to memory formation is excellent neurochemical health. 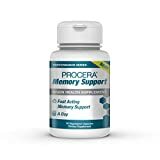 How does Procera AVH work for memory enhancement? The key is in the name of the product itself. “AVH” stands for the three main ingredients of the supplement, Acetyl L-Carnitine, Vinpocetine, and Huperzine A. Individually, each of these components has known value as a nootropic cognitive enhancer. Acetyl L-Carnitine (ALCAR) is converted into Acetyl-COA in the body, which is the pre-cursor for acetylcholine. This chemical is the neurotransmitter which spurs healthy growth of neurons and synapses. It facilitates communication along these pathways, leading to better overall memory formation. Vinpocetine is a known circulation booster, specifically in the brain. A steady supply of oxygen and nutrients is important for the general health of neural tissue. Vinpocetine is often taken on its own as a neuro-protective, to prevent long term damage relating to oxygen insufficiency in the brain. Finally, Huperzine A is an NMDA agonist and acetylcholinesterase inhibitor. It regulates levels of acetylcholine, and also stimulates the release of Nerve Growth Factor. This action further prompts healthy structural growth and vibrant communication in the brain. All of these ingredients promote the general conditions required for good memory function, and are commonly included in many nootropic stacks for cognitive health. But that is not all that you will find in the ingredients list of Procera AVH. The product also includes a long list of additives and preservatives which seem to be causing some significant side effects for users. Other ingredients like polyethylene glycol, phosphates, and stearic acids are thrown into the mix, with unknown impact. Many users have complained in online reviews about side effects like blurry vision and blood pressure issues. We generally don’t see reports like these from users of the individual components of the product. Why Buy Procera AVH Ingredients Separately? The relative dosages of the ingredients may also be a factor for side effects and efficacy. The manufacturer only lists a total milligram count for all ingredients without breaking down individual doses. This can definitely be an issue for people who are more or less sensitive to the product components. For example, people with blood pressure issues should be wary of taking too much Vinpocetine. These same people might have an acetylcholine deficiency which would benefit from a larger dose of Acetyl L-Carnitine. All flexibility with dosage is lost when buying this stack product. Purchasing any nootropic in bulk form is generally cheaper than branded products like Procera AVH. The added ability to carefully manage and adjust dosage is extremely valuable, especially if you are taking these compounds for the first time. The question of Procera AVH’s effects for memory enhancement might rely almost entirely upon dose. Does Procera AVH Work Or Not? We know that the basic ingredients of the product are excellent for overall cognitive health, including memory function. But the side effects, bad user reviews, and lack of versatility for dosing make this product less than ideal. A much better bet would be to buy Acetyl L-Carnitine on its own. For less than 20 dollars, you can buy 100 grams of Acetyl L-Carnitine, which translates into 200 daily doses of 500 milligrams each. Compare this to Procera AVH’s price tag, which retails for $40 – $60 for just 20 daily doses! What do you get for the high price tag of Procera pills? Additives and side effects. Buying nootropics like Acetyl L-Carnitine in bulk is the best way to explore the memory benefits of natural nootropic supplements.